The ideal child’s room is both practical and fun. Essentially, this means that whatever decorative elements you introduce, choose surfaces that can be easily cleaned and fabrics that are hardwearing. Always make sure that there is plenty of space for storing toys and clothes. When choosing wallpaper, it is worth noting that while pictorial designs are excellent for stimulating a small child’s interest, older boys will probably prefer a simple check or stripe. If you decide on paint, don’t cover all the walls in a dark colour as this may prove claustrophobic. Many children will treat their walls with little respect, seeing them as a convenient noticeboard for their posters and photographs, so it may be a good idea to provide a real noticeboard to minimize the damage! Painted furniture is an excellent idea for a child’s room. Tables, chairs, bookcases or a chest of drawers can be painted with a design of their choosing. It can always be repainted as the child grows up. When deciding on a bed, although they may be more expensive, bunk beds are extremely useful when friends stay overnight; they are also space saving and, of course, fun. If you choose a single bed, you can create a specialized bedhead, such as the one in this project. Colour pictures of cars from posters or glossy motoring magazines. It is important that the paper is thick rather than flimsy, as the latter is difficult to glue and will tear easily. Sand the bedhead down to remove all varnish and create a smooth surface. Wash the surface lightly with warm soapy water. Wipe it clean and leave until the wood is completely dry. Using a medium-sized paintbrush, apply a coat of grey undercoat to the bedhead. Leave it to dry for 12 to 16 hours. With the same brush paint the bedhead all over, including the sides, with matt black eggshell. Leave to dry for 24 hours. Cut the ribbon or paper border into four lengths, two long and two short, to fit along the sides of the bedhead exactly. If the width of your border is much less than 7.5 cm (3 in), you will need a double width to create the right effect. Carefully and thoroughly apply the glue to the surface of the border, and stick the lengths one at a time round the edges of the bedhead, overlapping them at each corner. Cut out the cars carefully. Decide on the arrange­ment you are going to have for the cut-out cars. You can use one big one, lots of little ones, or a combination of the two. Make sure that your design will fit in the space within the border before you start sticking the cars to the bedhead. Attach the cut-out cars to the bedhead with the re-usable adhesive. Once you are sure they are positioned correctly, stick them on with the wallpaper glue, making sure you cover the backs of the cut-out cars all over. 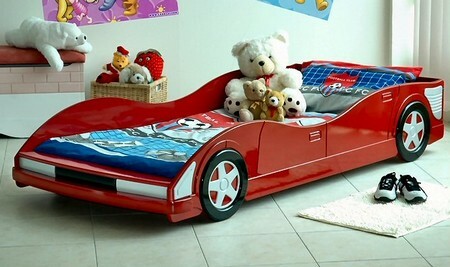 Firmly press the cars onto the bedhead, smoothing each one out so there are no air bubbles or creases. Leave for 24 hours so that the glue has plenty of time to harden. Finally, with the medium-sized paintbrush, apply a coat of clear satin varnish over the cars and the sides of the bedhead, but not over the ribbon. Leave for a further 12 hours, or until the varnish is completely dry.